Before successful lawsuits in the 1970s and 1980s revealed the link between asbestos and cancer to the public, American manufacturers used the toxic mineral in a variety of consumer products. Even today, harmful traces of asbestos are sometimes found in imported products. Though asbestos is usually associated with construction, heavy industry and shipbuilding, many companies also integrated it into common household items. The naturally occurring mineral is heat resistant, cheap and easy to work with, and manufacturers valued it so much they covered up the medical evidence of its disease-causing properties for decades. Asbestos-related diseases arise when microscopic fibers of the mineral become trapped in the lining of the lungs or abdomen and cause cellular damage over time. Historically, most asbestos exposure has occurred on the job. Asbestos miners and factory workers who had to handle raw asbestos on a regular basis have suffered the worst health consequences, and occupational asbestos exposure has also affected many other types of tradesmen and sometimes their families through secondhand exposure. However, asbestos-containing consumer products have extended the risk of exposure to men, women and children from all walks of life. From the early 1900s to the 1980s, American manufacturers used several types of asbestos materials in domestic goods, and asbestos contamination is still a major problem in the factories of the developing world. For most of the 20th century, asbestos was a primary ingredient in almost all types of insulation. No device was too big to insulate with asbestos — or too small. America’s post-WWII prosperity introduced an ever-growing list of gadgets to the modern suburban home. 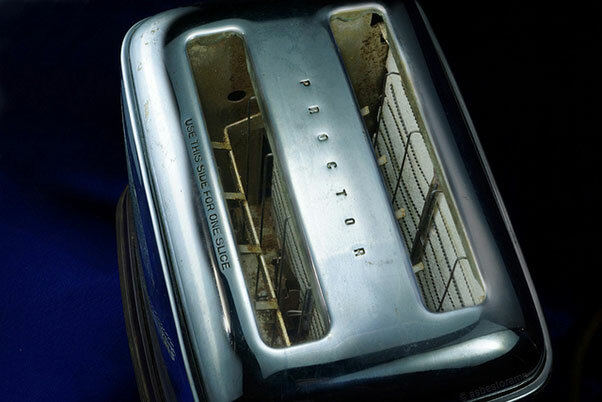 From electric ovens to automatic bottle warmers, nearly all of these new conveniences came lined with asbestos as an insulating and fireproofing material. While most home appliances did not present a serious asbestos exposure risk unless they were damaged or taken apart, hair dryers were an unfortunate exception. The asbestos insulation enclosing the heating element was often a soft, friable material that could release asbestos fibers into the heated air stream when the device was turned on. Friable asbestos could also often be found in the wire insulation for home appliances. Wear and tear on the wires could cause the insulation to fray, potentially releasing asbestos fibers that could be inhaled or ingested in contaminated food. Asbestos’s uniquely fibrous nature allows it to be woven into fabric. Many brands of wicking for gas ranges and oil lamps contained a high percentage of asbestos, which made the wicks last longer. However, these soft textiles could easily release asbestos fibers when disturbed. Finer types of asbestos-containing textiles found many other uses around the kitchen. Some brands of oven mitts, dish towels, pot holders and placemats were quilted with a high-percentage asbestos filler. Marketing for asbestos-containing towels claimed superior absorbency. Outside the kitchen, asbestos-containing cloth was commonly used for electric blankets, ironing board covers and fire blankets. Many manufacturers produced heat-resistant types of millboard by pressing asbestos and other fibrous materials into sturdy sheets. These cheap asbestos millboards were often sold as cooking mats and iron pads. Though they may have provided some protection against burning, the soft material they were made of could easily release hazardous asbestos dust. Asbestos-containing paper, normally used for flash guards in electrical panels, found its way into certain novelty items as well, such as combination ashtray-coasters. Thanks to the tireless profit-seeking of the asbestos industry, the toxic mineral found its way into countless facets of daily life. Loose asbestos fibers present the most extreme risk for asbestos exposure and the eventual development of diseases such as asbestosis and mesothelioma. Many people diagnosed with asbestos-related illnesses formerly worked in mines or factories where asbestos was extracted, processed or mixed with other materials. Tragically, however, exposure to raw asbestos was not limited to worksites. 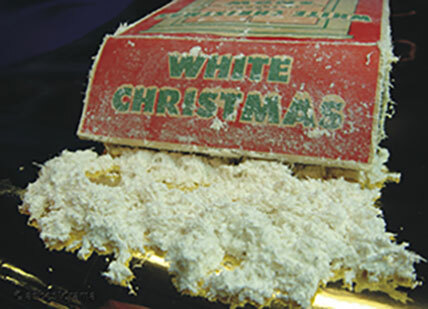 Fluffed chrysotile — commonly known as white asbestos — was once sold as fake snow for Christmas decorations. A similar type of processed asbestos was sold in Australia during the 1960s and 1970s as “Mr. Fluffy” insulation. Because the asbestos fibers settled into every crevice of the buildings they were blown into, the Australian government has found it extremely difficult to abate the asbestos from the affected homes. Traces of asbestos have often contaminated talc products. Asbestos naturally occurs in many talc formations, and while companies strive to make their products asbestos-free, there are no federal regulations to requiring it. 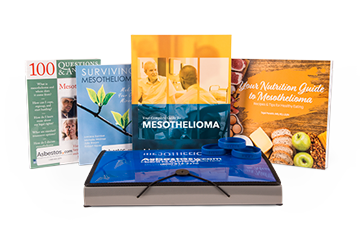 Many individuals who developed mesothelioma because of exposure to asbestos-contaminated personal hygiene products in the past have filed lawsuits against manufacturers to receive compensation. In 2015, a Los Angeles jury awarded Judith Winkel $13 million in a case against Colgate-Palmolive, which sold the Cashmere Bouquet brand talcum powder she regularly used in the 1960s. In 2016, Philip Depoian was awarded $18 million in a lawsuit against Whittaker, Clark & Daniels, which had manufactured the talcum powder his father used as a barber. Depoian had developed cancer because of secondhand exposure to the contaminated powder. Although the quality of talcum powder is now strictly controlled in the U.S., the talc used for manufacturing in other countries often still contains traces of asbestos. In China for example, there is still very little awareness of the risks of asbestos exposure, so many companies there have lax standards about asbestos contamination. In 2015, the Environmental Working Group (EWG) Action Fund detected asbestos in several brands of crayons and amateur crime lab kits sold in the U.S. In each case, the contaminated product was made with talc and imported from China. In December 2018, a report by Reuters News Service revealed internal documents, memos and communications from Johnson & Johnson about asbestos contaminating its talc-based Shower to Shower and Baby Powder products. The company is facing more than 11,000 asbestos-contaminated talc lawsuits. Walker, B., and Lunder, S. (2015). Tests Find Asbestos in Kids’ Crayons, Crime Scene Kits. Dodson, R., and Hammar, S. (2011). Asbestos: Risk Assessment, Epidemiology, and Health Effects. Boca Raton: Taylor & Francis. University of North Carolina Office of Environment, Health and Safety. (2011). Asbestos Control Program. Asbestorama. (2009). 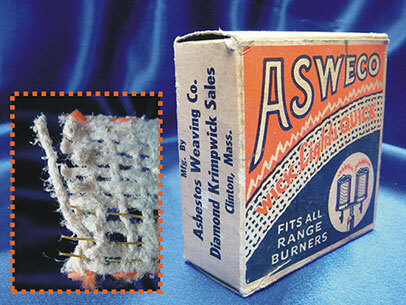 ASWECO Asbestos Wire-Wick & Detail. Asbestorama. (2009). “Radiant” Asbestos Cooking Mats & Detail. Wisconsin Historical Society. (2009). A Monarch Back-Flue. Wisconsin Historical Society. (2008, May 8). Asbestos Baby Bottle Warmer. U.S. Consumer Product Safety Commission. (2000). CPSC Staff Report on Asbestos Fibers in Children’s Crayons. U.S. Consumer Product Safety Commission. (1983, January 28). Chronic Hazard Advisory Panel on Asbestos. U.S. Consumer Product Safety Commission. (1980, May 30). Commission Approves Issuance of General Orders on Asbestos in Consumer Products. U.S. Consumer Product Safety Commission. (1979, August 31). Commission to Study Asbestos in Consumer Products.